Police refuse to permit right-wing activist to hold march in Ara and Arara. Baruch Marzel: Surrender, subservience to Arab public. 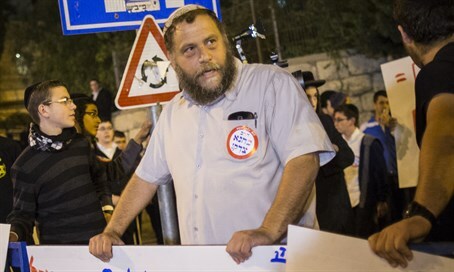 Police have not given permission for right-wing activists Dr. Michael Ben-Ari, Baruch Marzel, Itamar Ben-Gvir and Bentzi Gopstein to hold a protest in the Arab communities of Ara and Arara. The activists claim that they want to hold a march in protest against the effects of disloyalty to the state and of Arab officials even supporting ISIS in their attacks against Jews. Immediately after the terrorist Nashat Melhem was identified, members of the group Otzma Yehudit (Jewish Strength) requested to hold a march in the villages as an example of free speech. Police initially asked the organizers to wait a little but after the request was resubmitted a month later, they said that new security concerns would not allow the march to take place. Jewish Strength activists are furious over the decision and intend to appeal to the Supreme Court. Dr. Michael Ben-Ari said, "Israel Police are again putting their heads in the hand. Israel Police's refusal will not only stop the continuing riots in the Arab sector, but will encourage violence and terror. Baruch Marzel said, "Our march from the village of Ara to the village of Arara is from the place where the murderer set out to the place where he hid and received support from various sources. We demand to be allowed to march, and the police decision is a form of surrender and subservience. It is very disappoint that, after the statements and talk about the rule of law now being enforced in the Arab sector, the police tell us that they effectively have no control in the villages." Itamar Ben-Gvir, of the legal defense organization Honenu, will submit the Supreme Court appeal.